ALL ORDERS ARE SUBJECT TO THE FOLLOWING TERMS AND CONDITIONS. Standard Terms: 2% 10 Days, Net 30 Day from date of Invoice. Orders are invoiced upon shipment. 2% discount on merchandise only. MasterCard, Visa & Amex, accepted with proper authorization-NO DISCOUNT MAY BE TAKEN ON CREDIT CARD. Prices & Case packs subject to change without notice. All out of stock items will be automatically backordered unless otherwise notified. Freight charges for back orders are the customer’s responsibility unless otherwise agreed to with Customer Service. Sales through the Amazon.com platform are limited to an existing exclusive distributorship and are otherwise prohibited. 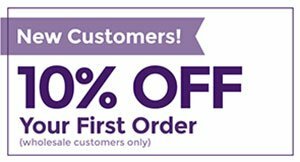 Established customers: Past Due accounts must be paid prior to new orders being shipped. The cost of any legal fees/collection will be paid by the delinquent account. New Account: Credit application must be completed in detail. Allow 4 to 6 weeks for credit to be established. Prior to credit being established orders will be shipped only if payment is received in advance. To avoid delay in shipping, customer may send a certified check, money order or use a credit card. Return Checks: A $25.00 service charge will be invoiced to your account. Truck: All orders are F.O.B. FACTORY. Our shipments are sent Prepaid/Billed on Invoice to avoid paying carrier directly. Please be advised that freight prices are subject to change without notice. You may request the freight company you wish to use. If possible, we will accommodate this request. If you do not have a preferred trucker, please call and we will assist you in choosing one. During warm weather months refrigeration must be used. FedEx: Charges are prepaid and added to your invoice. Orders are charged by weight and carton size. Our new policy during the warm month’s coolers will be at no charge for orders over $250.00. DAMAGES incurred must be reported to Customer Service within 10 days of receipt of shipment. Authorization must be given by Customer Service Department prior to any/all invoice deductions. Unreported damages will not be acknowledged and payment in full is expected. Truck: Please check shipments immediately for any damage/shortage and be sure the driver notes discrepancies on the freight bill. Do not deduct the cost of any item (s) from your invoice prior to contacting Customer Service. FedEx: Please check shipment for damage/shortages. Note discrepancies on the Delivery Receipt (Packing Slip) and contact Customer Service immediately. Do not deduct the cost of items from your invoice prior to talking to Customer Service. Charge-Backs: We require written notification on any/all changes made to your company specifications (e.g., billing address change, shipping guide/instructions, trucker). We must have this information prior to the designated ship dates. Unless these requirements are met, charge-backs will not be acknowledged. NOTE: There is a handling fee of $50.00 for each unsubstantiated charge-back/deduction. No merchandise returns of any kind can be accepted without prior R.M.A. # authorized by Customer Service. This authorization must be obtained within 10 days of receipt. DO NOT ADJUST CURRENT INVOICES-A credit will be issued when discrepancy is resolved. Kindly take the time to review your confirmation to insure your order is correct. Items ordered incorrectly by Customers are to be returned at customer’s expense and are subject to a 10% restocking fee. INVOICE DEDUCTIONS must be authorized by Customer Service within 10 days of receipt. Without this authorization deductions will not be acknowledged and payment in full is expected.